Content for a DVD cover should be written in a concise and vivid manner. DVD cover content is marketing material and should contain the best selling points. If a viewer is turned off by the cover, chances are he will not buy or watch the DVD. The content and graphics serve as a sales pitch and should give the reader an idea of what the DVD will feature, without a complete summary. It should entice the reader into watching the DVD by presenting just enough information. Watch the DVD. Watching the material is necessary before figuring out the DVD's strongest selling points. However, the director or producer may have a specific idea of what they want featured on the cover. If so, ask what are the top five selling points of the DVD, and if there are any specific content requests. Choose the most interesting points of the DVD. Is there a specific scene that caught your attention? What scenes or points stuck in your mind when you were done watching? These answers will most likely be key selling points for the viewers. Capitalize on what impacted you as a viewer and use these points to sell the DVD through the material featured on the cover. Drafting an outline or making a list of key points can help you prioritize scenes or events. If the DVD's content is elaborate, you can use the outline to help you include tantalizing information without spoiling the story. Find the DVD's greatest point of conflict. You may or may not want to include the conflict in cover content. If the greatest point of conflict is the only conflict, including it may give away the entire DVD. However, conflict is what keeps a viewer engaged and wanting to know more. You may want to hint at a conflict in the cover material, so that the reader feels the need to find out the result. Decipher your intended audience. Choose how you will reel in the viewer. If the DVD is geared toward a specific audience, capitalize on that, but also find ways to expand viewers. Find instances in the DVD that could speak to viewers outside the niche (if the DVD is specific). Describing the DVD with a sense of universality will help you market not only to the intended audience, but any possible buyers as well. For example, if the film is an action film geared toward a male audience, include any tidbits about possible romance to expand intrigue to female viewers. Make sure the front cover of the DVDs is graphically oriented. Often the front cover is composed of a photo or graphic, the title and the lead actors (usually the most reputable actors). Sometimes, the front cover will also include a testimonial from a review. Write content on the back cover. After the graphic draws the viewer in, they will look at the back to find out if the graphic portrays the story. Keep the front graphic in mind, along with the DVD's content, when writing the material for the back cover. Keep space in mind. You are limited to the back cover, which will also contain graphics or photography. Credits and testimonials will also be included here. 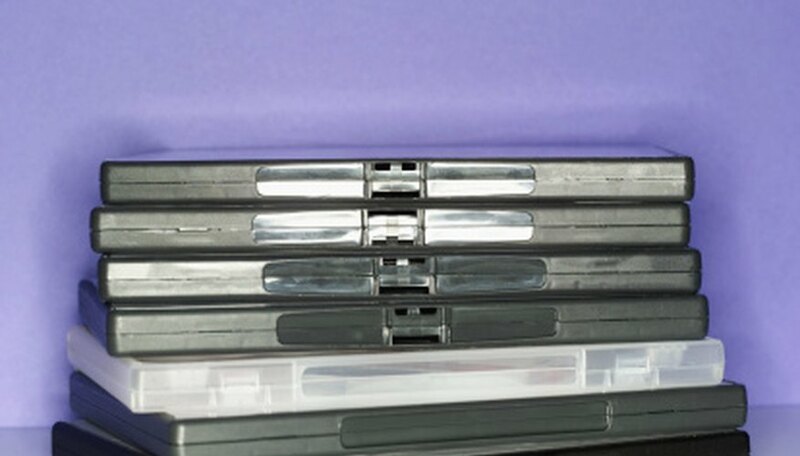 DVD cases are 5.5 inches by 9 inches. The area available for written content is usually half or less of the space on the back. So, you will probably only have room for no more than ten sentences. Keep it simple, concise and remember that the content's main objective is to inform and sell. Pull it all together. Now that you have assessed the DVD's content, conflicts, characters and audience, assess what presentation will be the best selling point. Should you offer a short summary? Should you tease the audience as to the most stressful conflict included? Is there something new and provocative that the DVD has to offer? Are there famous actors that can help sell the DVD that you should focus on in your description? Once you decide on the best selling points, write them concisely and accurately, including the proper citation of actors, authors, writers, producers or anyone else that you will feature in the content. Back up the content with testimonials. Retrieve testimonials from anyone who has reviewed the film. For example, "The Dark Knight" features a quote at the top of the back cover by Peter Travers, of Rolling Stone, that says "Prepare to be wowed." This testimonial is short and does not take up a lot of space, but helps as a convincing selling point from a reliable source. Edit the final content. After writing a few succinct sentences, review the content with the DVD's creator. Edit for factual information, attributes, spelling, grammar and effective marketing. Rewrite as necessary and then consult with the designer to insert the written material into the DVD cover layout. Review as many DVD covers as possible to get an idea of what is proper DVD cover content. Look at best-selling films for the best results. Do not plagiarize or steal content from other DVDs. Do not make up testimonials.